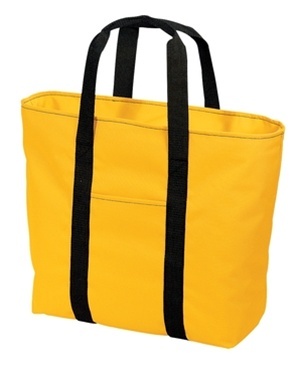 This go anywhere tote is great for around town, shopping and the beach thanks to its generous size and durable construction. Measures 15.5"w X 15.5"h X 7.5"d and is made from 100% polyester. Zippered top opening, front pockets, zippered inside pocket, key chain and black web handles.